That spare room in your home could be better utilized in many different ways. Converting it into a guest room, walk-in closet, or home office are all good uses of the space, but here’s another idea you may not have thought of – creating a craft room. A craft room can also be known by other names, such as a hobby room, sewing room, or art room. Whatever name you give it, this room has one main purpose and that’s to provide a special space within your home to nurture your creative side. Perhaps you’ve had a longtime passion for a certain hobby that’s fallen by the wayside over the years, simply because you just lacked a properly set up space to enjoy it in. Or maybe you’ve had a long-simmering interest in a specific creative pursuit that you’re looking to explore. If so, a craft room is the perfect environment in which to begin or rediscover a hobby that provides a healthy outlet for your creativity. Having a dedicated crafting room conveniently allows you to easily resume working on a project whenever you have free time. Many psychologists believe making time for creative activities clears your mind, heightens your mood, and generally provides health benefits. No doubt, you’ve heard about the benefits of kids staying creative. Adults can also certainly benefit from indulging in their creative side. After all, what could be healthier than escaping from the hectic pace of life with a little “you time” that revolves around one of your interests or passions? Time spent in a craft room doesn’t necessarily have to be all about a solitary creative experience, either. This dedicated space can also be used to facilitate more fun family time working on collaborative projects. Pinterest, Instagram, YouTube, Facebook and hobby-specific blogs and websites are a bottomless source of rich information and inspiration for the creatively inclined. With so much access to these creative resources, it’s no wonder “old school” pastimes like sewing and knitting have seen a resurgence in popularity. Tesco, the UK’s biggest retailer, announced in 2016 that sales of sewing and knitting pattern kits aimed at kids had increased by almost 500% in their stores in the past year. Just earlier this week, actress Krysten Ritter (Breaking Bad, Netflix’s Jessica Jones) was on The Daily Show talking about how cool it was to knit. There couldn’t be a better time to invest in a space that allows your creativity to flourish. Utilize these seven craft room ideas to help you create the most creative of spaces. Choosing the right location for your craft room should be one of your first considerations. If you have a lone spare room, there’s not much of a decision to make. But what if you have a few more options when it comes to free space in your home? If the latter situation applies to you, certain parental responsibilities may need to factor into the location of a craft room. A parent with younger kids may not want to set up their new hobby room in, say, the basement. A more centralized home location that better accommodates close supervision and availability would make more sense. However, if you don’t have kids or your children are older and more independent then picking a more private space for a craft room is ideal. You’ll be able to focus more on your hobby without household distractions, which should aid your creative process. It might seem that a room with more natural light would be more conducive to creative thinking, but not necessarily. Some studies indicate that a darker environment helps some people be more creative. Customize your craft room to your hobby’s needs. Wherever your craft room ends up, you’ll want to get the most out of your dedicated creative space. Working with professionals like the design consultants at Organized Interiors will help you to have a room designed that’s optimized for high functionality. High functionality and customizing your space so it aligns with your hobby’s needs go hand in hand. If sewing is your passion, you’ll need plenty of flat work space that can accommodate a sewing machine and room for everything involved with your current sewing project. 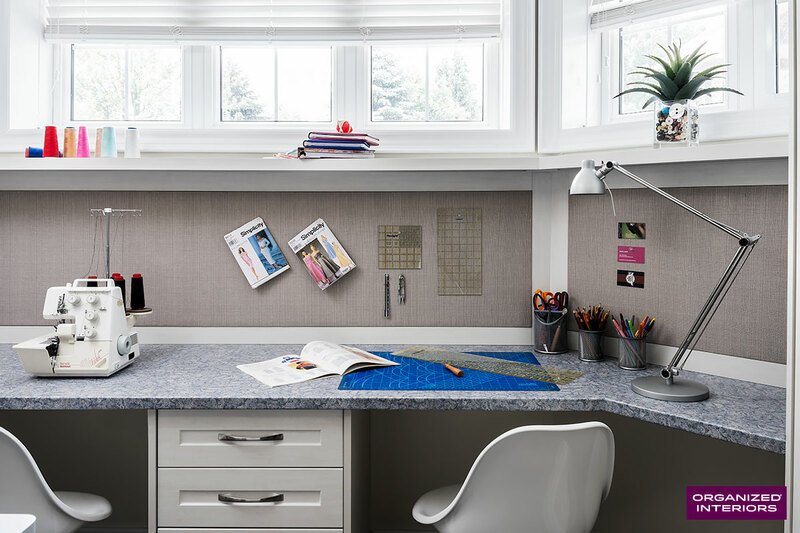 Tailoring your craft room to your hobby and how you work could also include adding an island with hidden storage, designing an L-shaped work surface, or creating a peninsula-style work surface that juts out from your desk and has open space on three sides. These different designs may be more suited to crafting spaces where more than one person at a time will be working on the same project. A craft room doesn’t have to be limited to a single activity, of course. Having your room designed to cater to multiple creative pursuits for yourself or other family members makes even smarter use of the space. Two or even three zones in the craft room each be customized to a specific hobby. For example, a scrapbooking hobbyist could have file drawers incorporated into the lower half of their custom cabinetry design to store their scrapbook collection. 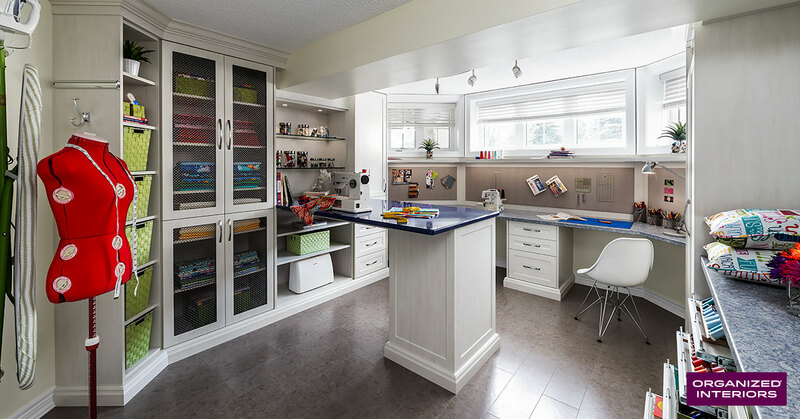 Designing a multi-purpose space with craft room zones will minimize the likelihood of disorganization within the room and create an effective workspace for all participants. Investing the time, money, and space in having a craft room designed and installed ideally means you’ll be spending plenty of time within the space. Some of your projects may involve spending hours at a time in the same working position, so your comfort is important. An extremely important decision when setting up your craft room will be your choice of chair. It’s worth it to spend a little more on an ergonomically correct chair that will save your back from fatigue during long crafting sessions. Choosing the right height for your main work desk also goes a long way towards making your creative time a more comfortable experience. You could even have a standup workstation added to the design of the room, providing an additional workspace option that lets you stretch your legs. Lighting will also play an important role in your crafting room’s comfort level. Find a good balance of ambient lighting and task lighting that suits your needs. A lot of crafting tasks require fine attention to detail, so effective task lighting is a must to minimize eye strain. Physical comfort is important. So is mental comfort. A relaxing, welcoming space fosters more creative energy and how that environment looks will play a large role in how it feels to you. Being able to customize your craft room cabinetry will allow you to have a room designed that provides great functionality and matches your personality and design tastes. That means your new room will also mesh well with your home’s existing décor. 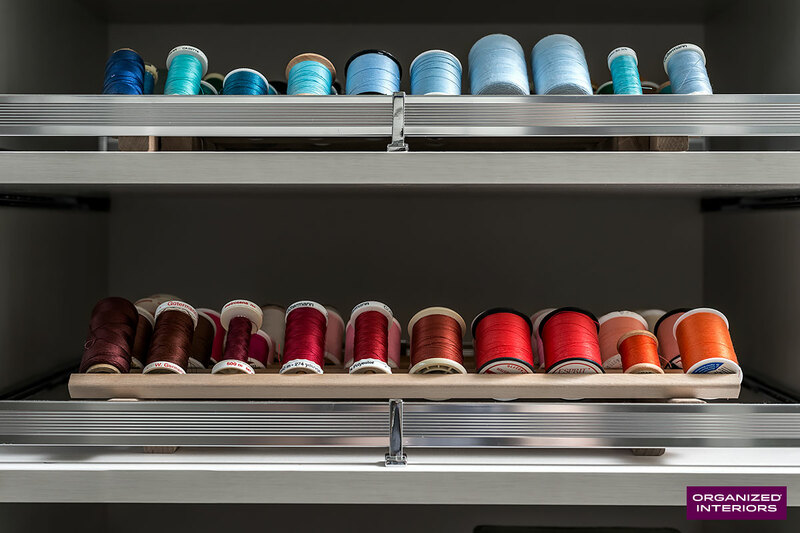 Handy pullout shelves keep your thread collection easily accessible and well-organized. Creative minds typically have an appreciation for the smaller, finer details in life. Things like nice finishing touches in a new room. A craft room provides lots of opportunities to include tasteful personalized finishing touches that add design flair, character, and functionality. Strategically placed lighting can be functional and add effective accents to your custom cabinetry to create a dynamic look. Cornice molding seamlessly integrates your craft room cabinetry with your existing room design for a clean, modern aesthetic. Adding a tack board or magnetic white board to the craft room wall provides an area for posting project notes, reference photos, inspirational quotes, shopping lists, and other helpful reminders. Accessories like pullout valet rods and hooks provide handy hanging options. Plants, artwork, and a nice rug can personalize your space even further. The benefits of an organized closet aren’t limited to just the bedroom. Organized Interiors specializes in creating spectacular closet spaces for any room in your home, including the craft room. Whether you need hanging space for ongoing sewing projects or extra storage for craft room materials, a smartly designed closet enhances any craft room with its efficient use of storage space. Make space for your creativity! Schedule your free in-home consultation to learn more about how we can design a personalized, one-of-a-kind craft room for you that provides a valuable space for nourishing your creativity. Sign up for special offers and new product announcements that we send out from time to time.